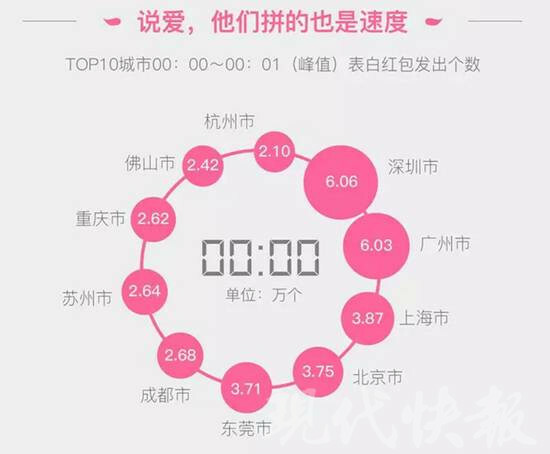 WeChat recently released its hongbao data on May 20, China’s unofficial Valentine’s Day, providing us with a glimpse of Chinese enthusiasm towards using the digital red envelope as a way to convey their love and emotions to their family members and friends. In China, the number combination “520” has come to stand for “I love you” (五二零wǔèrlíng sounds like 我爱你 wǒaìnǐ). May 20 has become a festival for Chinese to express love and affections to their beloved ones. While gift-sending is a traditional way of conveying love, digital red envelopes have become popular with the rise of WeChat hongbao in recent years. This year, WeChat set ten amount types of hongbao for confessions of love, with the value ranging from RMB 0.52 to RMB 520. Between midnight and 6 pm, the most popular hongbao amount was RMB 5.20, with 102 million such red envelopes sent, followed by RMB 52 (roughly 40 million red envelopes sent) and RMB 520 (roughly 12 million). 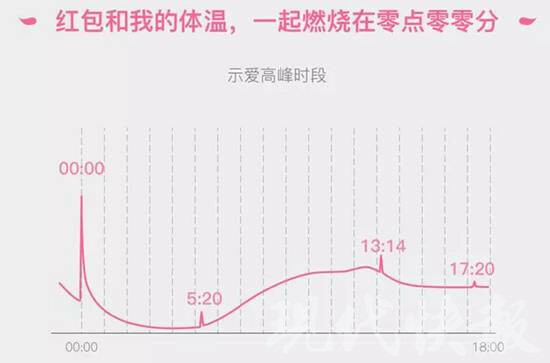 In less than one minute past midnight, as many as 1.38 million digital red envelopes were sent out on WeChat, making it the peak time for hongbao-sending as people can hardly wait to express their affections. Shenzhen saw the most red envelopes sent out across the nation during the first minute peak time, with 60,600 sent. And the city sent out a total of 5.61 million WeChat hongbao during the day, the most among major Chinese cities. The city is trailed by Shanghai, Guangzhou, and Beijing in terms of the number of hongbao sent. The luckiest individual is a 27-year-old girl from central China’s Huaihua city, who received 811 red envelopes, while the first lucky money red envelope of the amount RMB 520 was sent by a 41-year-old Shanghai man. In terms of age, the post-80s generation constitutes the main force of the hongbao-senders, representing 35% of the total. The post-90s and the post-70s account for 29% and 26% of the total respectively, while the post-60s represented 8%. The figures actually reflect how popular WeChat red envelopes have become in China. Since it went online on Dec. 28, 2013, the feature has proven to be a resounding success in creating more payment demand, shaping user habits, and increasing user engagement towards WeChat’s mobile payment system WeChat Pay, which took a 37.02% share in Q4 2016 of the country’s third-party mobile payment market, and sees the gap with the top player Alipay (54.1% share) keeping narrowing.